Autoimmune hemolytic anemia is anemia secondary to premature destruction of red blood cells caused by the binding of autoantibodies and/or complement to red blood cells. Alloimmune hemolytic anemia occurs following blood transfusions due to transfusion of incompatible blood, to immunization by multiple previous transfusions, or during pregnancy, usually by Rhesus immunization of the mother. In autoimmune hemolysis, an unstable balance between cell destruction and regeneration is often present, which may worsen rapidly, leading to severe anemia and death. Autoimmune hemolytic anemia is most common in women <50 yr. Suspicion of an immune hemolytic process may arise from a routine blood count, if a fraction of microcytic hyperchromic erythrocytes is present. These cells appear as microspherocytes in the blood smear. Especially with IgM autoantibodies, erythrocyte agglutination is visible in the blood smear. So-called cold agglutinins, which usually are of the IgM type, may also cause acral necroses (Fig. 3.5). In this situation antierythrocytic antibodies must be sought using the Coombs test. If it is positive, then a diagnosis of autoimmune hemolytic anemia is established. Fig. 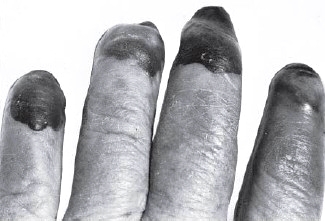 3.5 Necrotic spots on the fingers in a 61-year-old woman with cold agglutinin disease. Autoimmune hemolytic anemia is often secondary, therefore an underlying cause should be sought. A medical history and physical investigation aimed at the diseases mentioned in Tab. 3.7 should be performed. 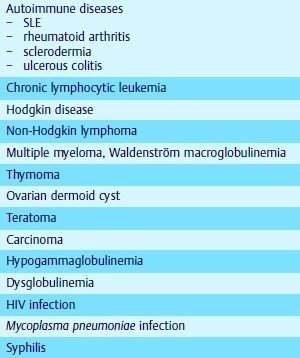 In addition, a bone marrow examination to exclude a lymphoma or multiple myeloma, serologic tests for lupus erythematosus, and radiologic examinations searching for enlarged lymph nodes and splenomegaly should be performed. A self-limiting, though severe, autoimmune hemolysis with cold-acting IgM antibodies may occur after infections with Mycoplasma pneumoniae or Epstein-Barr virus (mononucleosis). Drugs that have been repeatedly described as provoking an autoimmune hemolytic anemia are: a- methyldopa, penicillin, cephalosporins, tetracycline, tolbutamide, chinidin, and stibophen. For a number of other medications, case reports have been published with variably convincing evidence of causality. 3. Antibody directed against complex formed by drug and plasma proteins; the drug-plasma protein-antibody complex causes destruction of RBCs (innocent by-stander, e.g., quinidine). Evaluation consists primarily of laboratory evaluation to confirm hemolysis and to exclude other causes of the anemia. Prognosis is generally good unless anemia is associated with underlying disorder with a poor prognosis (e.g., leukemia, myeloma).